Weiler Labeling Systems’ (WLS) VCV-Series vial coder allows for the coding and inspection of unlabeled cylindrical products (i.e. Brite Stocking) with simple tool-less changeovers between runs of product sizes. 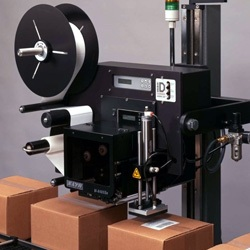 With its small footprint it can easily be integrated into existing packaging lines. 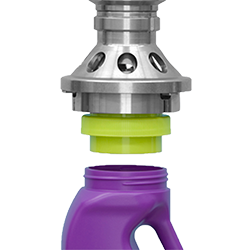 The vacuum dial design with an optional neck support feature allows for precise control of the vials when accurately positioned printing is required on the vial neck. The vacuum feature also allows for the precise rejection of vials whose code could not be read correctly. Coding of the product body, cap or neck. 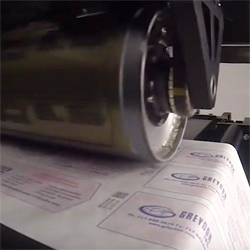 Human-readable or 2D Data Matrix, visible or UV ink code printing. Coding in a continuous mode using ink jet or laser printers. Inspection for properly printed code using the most widely used vision systems. For more information about WLS' coding solutions and services please call us at 856-273-3377 or email us at sales@weilerls.com. 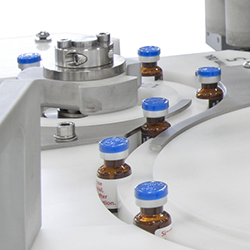 Rotary platform capable of coding and code verification on vials at speeds up to 300ppm. Multi-dial rotary platform capable of coding and code verification on vials at speeds up to 400ppm.